Central TET CTET 2019 Notification and Schedule: The Ministry of Human Resource Development, Govt. of India has entrusted the responsibility of conducting the Central Teacher Eligibility Test (CTET) to the Central Board of Secondary Education Delhi. The Central Board of Secondary Education would issue Central Teacher Eligibility Test(CTET) 2019 Notification in June, 2019. 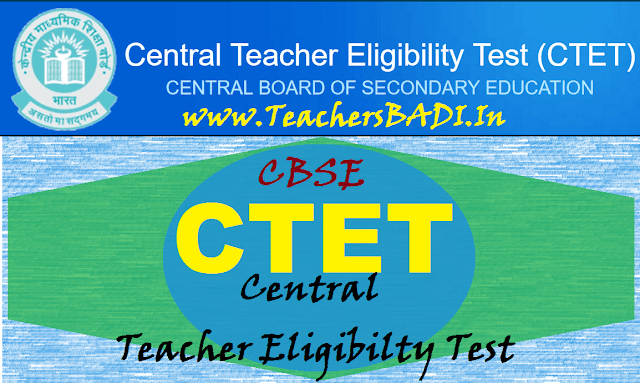 The Central Board of Secondary Education, Delhi will be conducting the Central Teacher Eligibility Test (CTET) for a person to be eligible for appointment as a teacher for classes I to VIII on in July. Candidates can apply only On-line for CTET 2019 on CBSE/CTET website. CBSE invites online applications from the eligible candidates, who intend to be teachers to appear for CTET 2019. The Central Teacher Eligibility Test (CTET) will be held on July 7 and online application submission will end on March 12. Candidates can apply for the CTET 2019 till March 14. However the last date for payment of fee is March 15 till 3.30 pm. Central Board of Secondary Education (CBSE), the exam conducting body, will allow one chance to candidates to rectify errors in their application, if there's any. The online correction window will open from March 25 till April 1. CBSE will announce the CTET result within 6 weeks from the date of exam. In the last CTET held in December more than 18 lakh candidates had appeared. A total of 1,78,273 candidates qualified in the primary classes category which is only 17% of the total number of candidates who appeared in this category. 10,73,545 candidates had appeared in the Primary category. The eligibility test determines a candidate's eligibility for appointment as teachers to primary and upper primary classes. CTET is conducted on national level and its scores are accepted for shortlisting candidates for recruitment exams. The online application process will start from 05-02-2019. The last date for submitting online application is 12-03-2019 and fee can be paid upto 15-03-2019 till 3.30.p.m. The CTET examination is conducted by CBSE twice in a year - December and July. The CBSE Board will conduct CTET July exam on July 7, 2019. Step 1: Fill in your personal details in the Application Form and note down your Registration No./Application No. CBSE CTET 2019: The Central Board of Secondary Education will conduct the Central Teacher Eligibility Test (CTET) 2019. Central Teacher Eligibility Test (CTET) will be conducted twice in a year. Central Board of Secondary Education, CBSE would be conducting the Central Teacher Eligibility Test, CTET 2019 examination on July 7, 2019. The notification regarding the examination date for this year’s examination was released by CBSE last month. The exam date for the start of online application forms for CTET 2019 July examination, however, have not been notified yet on the official website ctet.nic.in. CTET, as per the RTE Act, is a mandatory qualification for candidates interested in taking by teaching jobs in the centrally funded schools. TET is mandatory for classes I to VIII across the country. CBSE had conducted one examination in December. The next examination is scheduled for July 7, 2019. Interested candidates would be required to fill online application forms on the official website, once released. As source of CBSE, CTET 2019 online application forms may commence in the month of February. The notification is expected by second week and the online application forms are expected by late February or early in March 2019. Exact dates would be informed, once released. Candidates, in the meanwhile are advised to keep a check on the official website for updates regarding the same. CTET July 2019 exam date declared, detailed notification to be out soon. The Central Board of Secondary Education (CBSE) has declared the date of Central Teacher Eligibility Test (CTET) 2019 examination. As per the notification available on the official website of the CBSE CTET, "the next examination of CTET will be conducted on 07-07-2019. The notification will be issued soon." The notification currently available on the official website of the CTET exam only mentions the date of exam i.e. July 7, 2019. The detailed notification regarding the CTET 2019 examination will be released very soon on the official website ctet.nic.in. The CTET 2019 examination will be conducted by CBSE twice a year. The dates for CTET December 2019 exam is not declared yet. CBSE CTET December 2018 Results were declared on January 4, 2019. The CTET 2018 December session exam was held on December 9. CTET to be held twice in an year. The examination is an eligibility test for teachers (Class 1-8). The Board has been mentioning about the burden with conducting multiple examinations in a year. Recently the Board has proposed of conducting the eligibility test for assistant professors, National Eligibility Test (NET), only once a year. Following consultations among officials from the CBSE, the HRD Ministry and the National Council for Teacher Education (NCTE), it has been decided that CTET should be conducted only once. CTET 2019 Eligibility Criteria has been modified by the CBSE upon receiving clarification from the National Council for Teacher Education (NCTE). A Corrigendum has been released on the official website of Central Teacher Eligibility Test - ctet.nic.in, stating the modified Point 6.1 of the Information Bulletin of CTET 2019. As per the amendment, candidates who are B.Ed qualified and have applied for Paper II can now apply for Paper-I as well. CBSE is scheduled to organize the 11th Edition of Central Teacher Eligibility Test i.e. CTET 2019 in two slots viz Paper-II 9:30 am to 12:00 pm and Paper I - 2:00 pm to 4:30 pm, for candidates aspiring to serve as teachers for Class I to VIII in schools that come under the purview of the Central Government (KVS, NVS, Central Tibetan Schools, etc) and schools under the administrative control of UTs of Chandigarh, Dadra & Nagar Haveli, Daman & Diu and Andaman & Nicobar Islands, Lakshadweep and NCT of Delhi..
A. Minimum Educational Qualifications for becoming Teacher for Classes I-V (Primary Stage): The candidates having the following minimum educational qualification are eligible for appearing in CTET. Senior Secondary (or its equivalent) with at least 50% marks and passed or appearing in final year of 2- year Diploma in Elementary Education (by whatever name known). (OR) Senior Secondary (or its equivalent) with at least 45% marks and passed or appearing in final year of 2-year Diploma in Elementary Education (by whatever name known), in accordance with the NCTE (Recognition Norms and Procedure), Regulations, 2002. (OR) Senior Secondary (or its equivalent) with at least 50% marks and passed or appearing in final year of 4-year Bachelor of Elementary Education (B.El.Ed). (OR) Senior Secondary (or its equivalent) with at least 50% marks and passed or appearing in final year of 2-year Diploma in Education (Special Education). (OR) Graduation and passed or appearing in final year of two year Diploma in Elementary Education (by whatever name known). B. Minimum Educational Qualification for becoming Teacher for Classes VI-VIII (Elementary Stage): The candidates having the following minimum educational qualification are eligible for appearing in CTET. Graduation and passed or appearing in final year of 2-year Diploma in Elementary Education (by whatever name known). (OR) Graduation with at least 50% marks and passed or appearing in 1-year Bachelor in Education (B.Ed). (OR) Graduation with at least 45% marks and passed or appearing in 1-year Bachelor in Education (B.Ed), in accordance with the NCTE (Recognition Norms and Procedure) Regulations issued from time to time in this regard. (OR) Senior Secondary (or its equivalent) with at least 50% marks and passed or appearing in final year of 4-year Bachelor in Elementary Education (B.El.Ed). (OR) Senior Secondary (or its equivalent) with at least 50% marks and passed or appearing in final year of 4-year B.A/B.Sc.Ed or B.A. Ed/B.Sc.Ed. (OR) Graduation with at least 50% marks and passed or appearing in 1-year B.Ed. (Special Education). Date of Examination: 07-07-2019. Paper II will be held in the morning Session by 9:30 AM to 12.00 Noon and Paper I will be held in the evening session by 2.00 PM to 04:30 PM. 5. Centre of Examination As indicated on the Admit Card 6. Declaration of Results on or before. Within 06 (Six) weeks from the date of conduct of the examination. 7. Material to be brought on the day of examination Downloaded Admit Card and valid ID Proof (any of the following) documents such as "PAN Card, Aadhaar Card, Passport, Ration Card, Voter ID Card, Driving Licence and Pen etc. 8. Rough Work All rough work should be done in the Test Booklet only. The candidate should NOT do any rough work or put stray mark on the Answer Sheet.